Thank goodness for Mr. Singh! When we found ourselves grounded in Delhi (weather cancelled our flight to Agra from Rishikesh), once more our driver Mr. Singh came to our rescue. 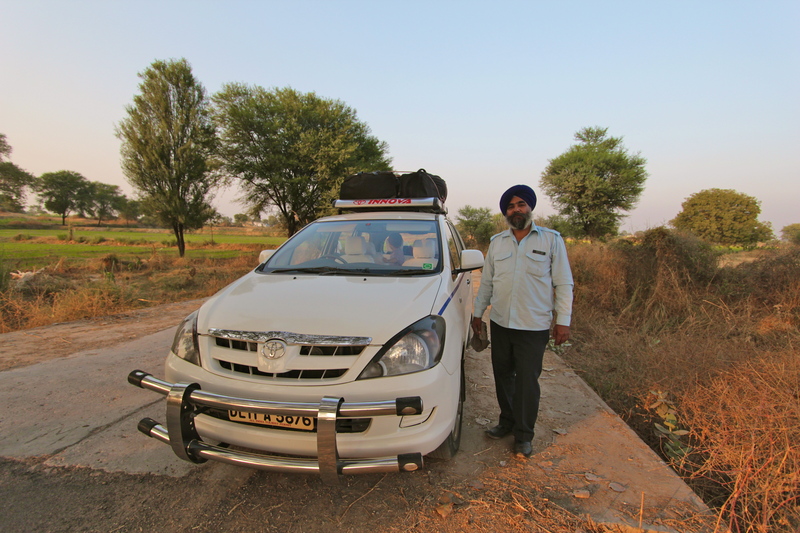 Who better to shepherd us around India and keep us safe, then a big, wise Sikh with a bright blue turban offering sage advice like, “if you don’t bother a snake, then he will not bother you” (meaning be careful interacting with strangers). Click image above to view “STREET VIDEO”. With everyday we feel more confident. It’s definitly getting easier. With Mr. Singh at the wheel, we sped along the two lane highway from Delhi to Agra asking questions about anything and everything; from Hinduism, sikhism, and arranged marriages, to the eating habits of pigs (some advice, best not to eat pigs in India as they are used to clean up garbage). Knowledge is power! 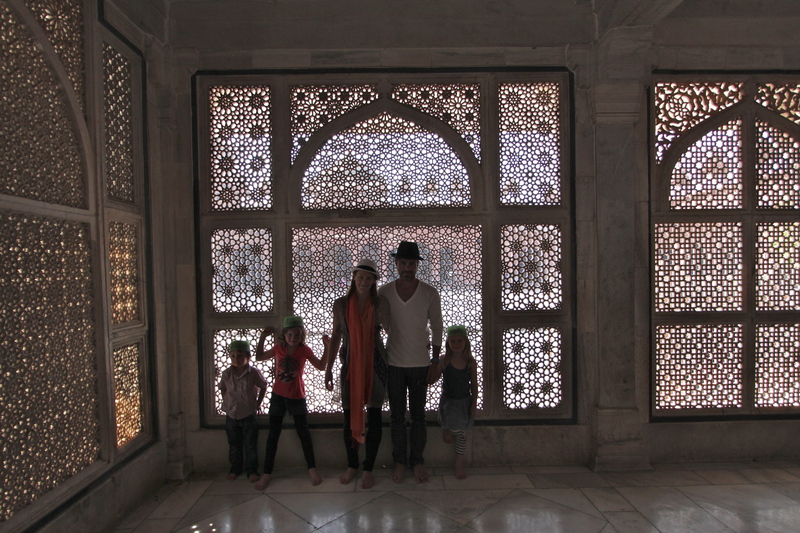 We arrived in Agra just in time to be at the Taj Mahal for sunset. 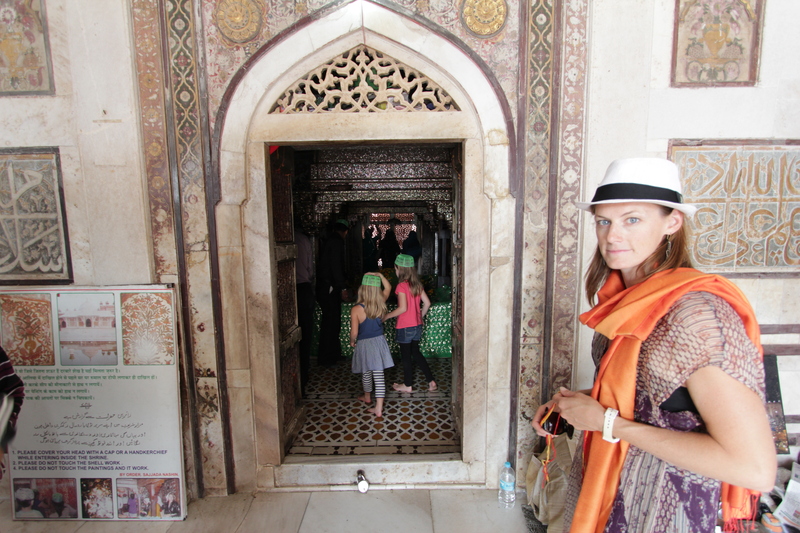 Even with all the fanfare and hype, the Taj Mahal is incredibly stunning and doesn’t dissapoint. 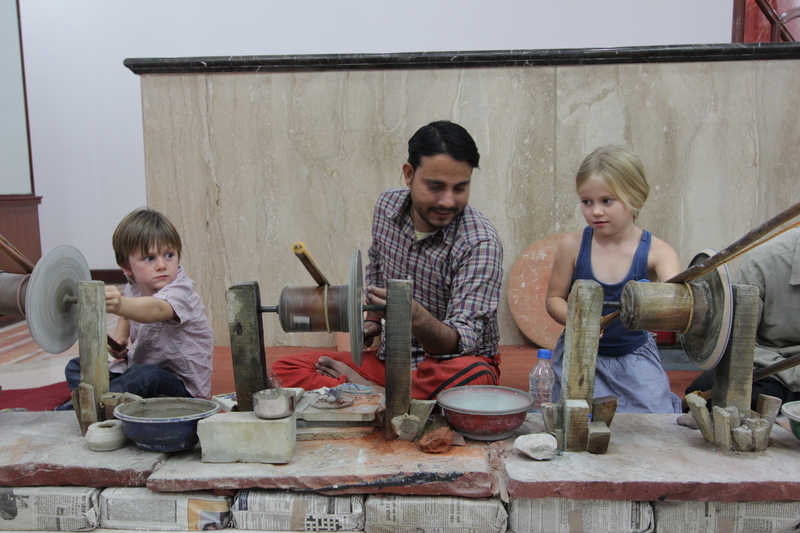 Kate and Ash work at polishing stones to inlay into marble. Isn’t it funny that when you finally start to feel comfortable, it’s time to leave. I know we’ll come back, just maybe not with all our ‘little’ waddling ducks in tow, or when they’re a touch older. 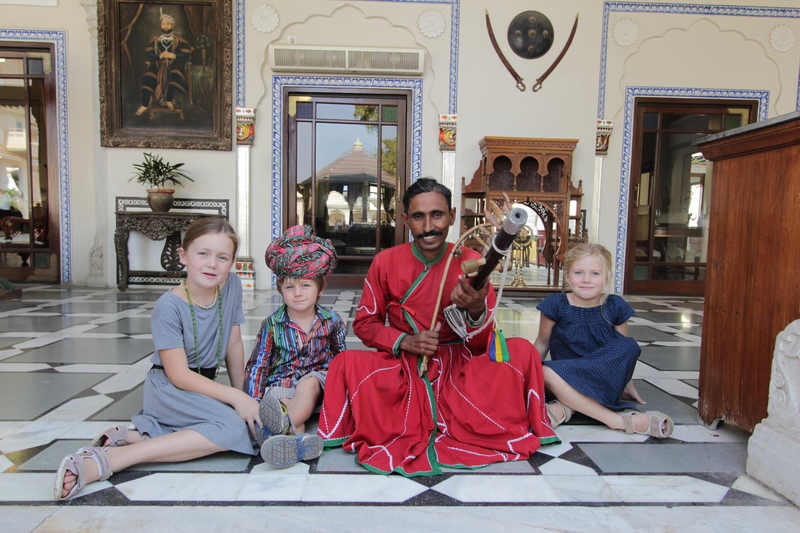 Traveling with kids in India is challenging, not only because of the food and safety but also because of all the attention. In some places we have caused a crowd, and although it is well-meaning, it can be exhausting and slightly stressful, and thus hard to relax. There have been no close calls, on the contrary, everyone showed huge smiles and clearly were enthralled. I guess the sheer numbers of people in constant and close proximity raised the chance of a “bad apple” getting close enough… in our minds at least. Losing something irreplaceable is obviously enough to keep you on edge. 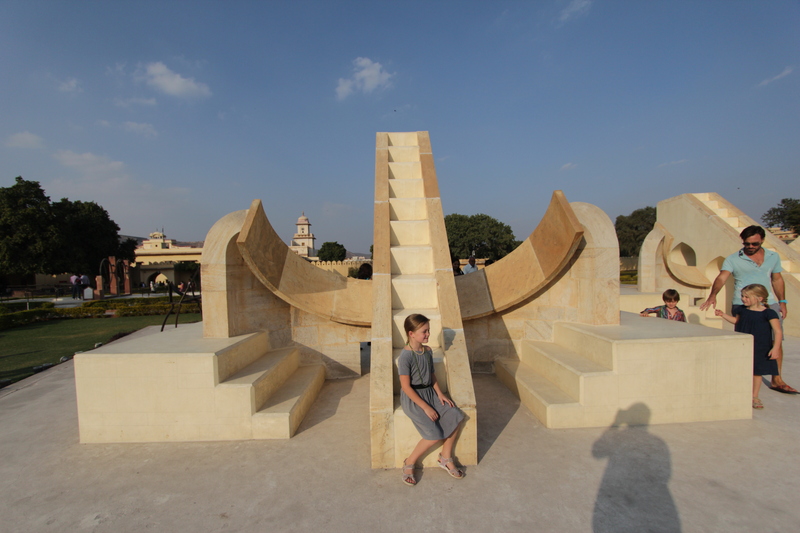 There are two Indias (well thousands really but,). One as opulent as you will find anywhere in the world, the other extremely poor. There’s little middle of the road when it comes to accommodation. 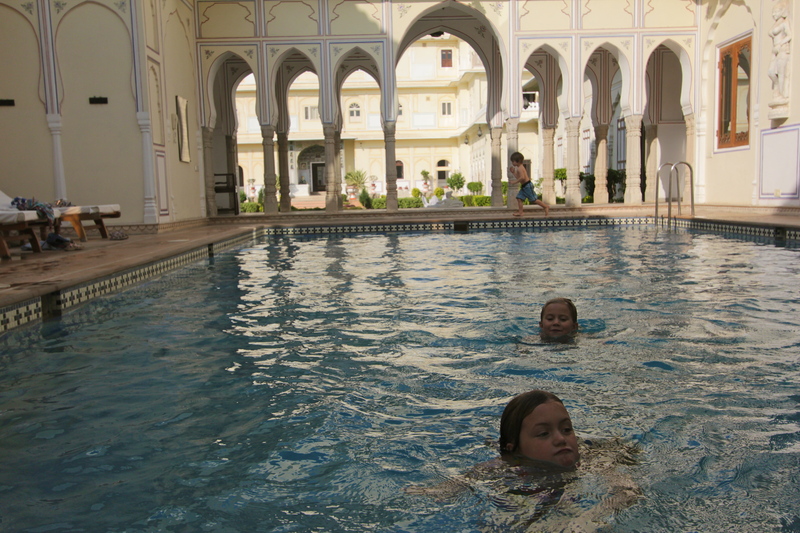 It’s hard to find anything halfway that feels safe for the kids to run around, and for us to relax. So, India has been more expensive then I would have thought. 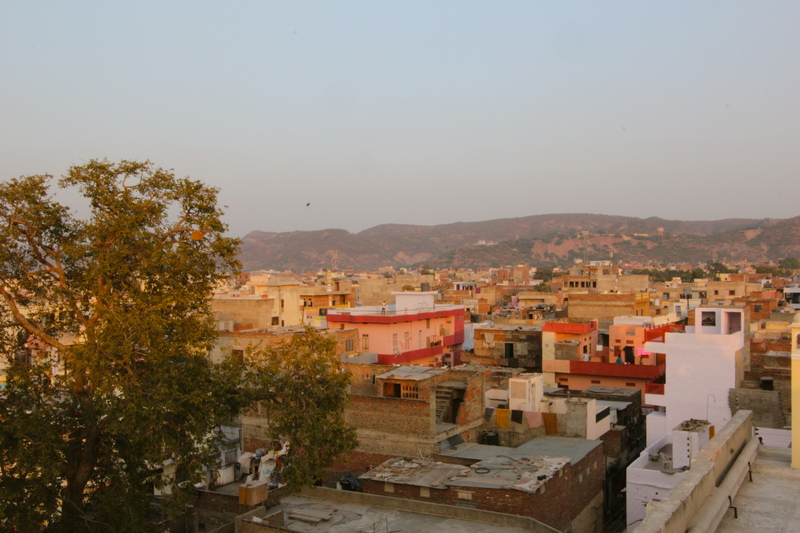 We’ve made our way to Rajasthan province. It’s desert country, like Palm Springs but without all the manicured golf courses. The high hilltops are adorned with castles and forts. Very romantic. 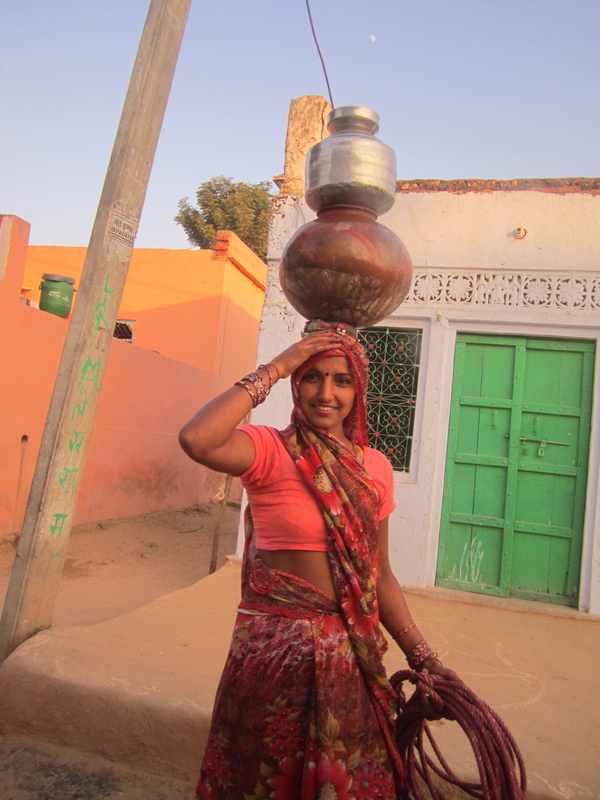 A pretty village lady fetches water from a well. The rope is for lowering her container. 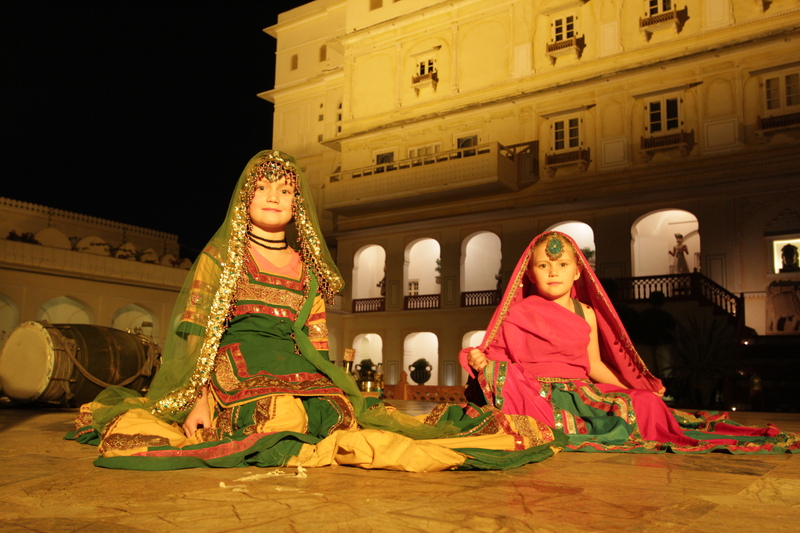 Even those with little, wear beautiful saris. 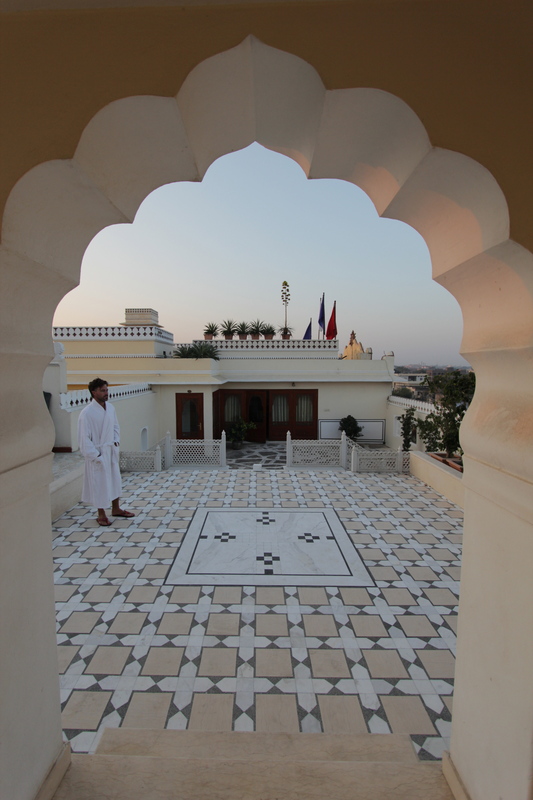 For our last few days we are staying in Jaipur, in a hotel that was a former palace to a Maharaja. 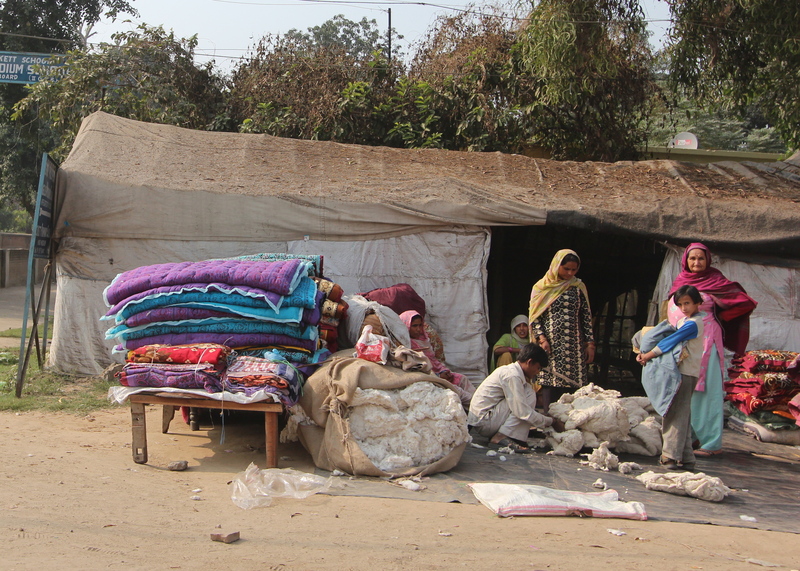 It couldn’t be more different then Rishikesh. It was night by the time we arrived at the hotel and Ashton was fast asleep in the car. I carried him into the hotel where I laid him on a swinging settee. 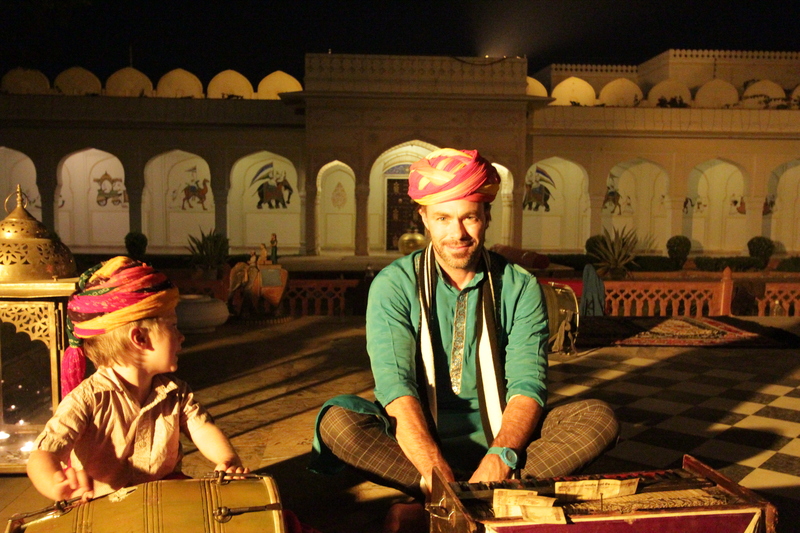 When he awoke I whispered, “you’ve become a prince and this is your castle.” His eyes wide, he looked around and indeed it seemed like that: the giant Indian style courtyard filled with the sound of beating drums and twirling dancers with pots on their head, and only his sisters watching the performers. Without a second of hesitation, he ran to join them and then the fun began. The dancers dressed us up in costumes and the girls danced around. Ashton has a ride on a horse. The hotel is virtually empty, this is the kind of staff:guest ratio you could get used to. 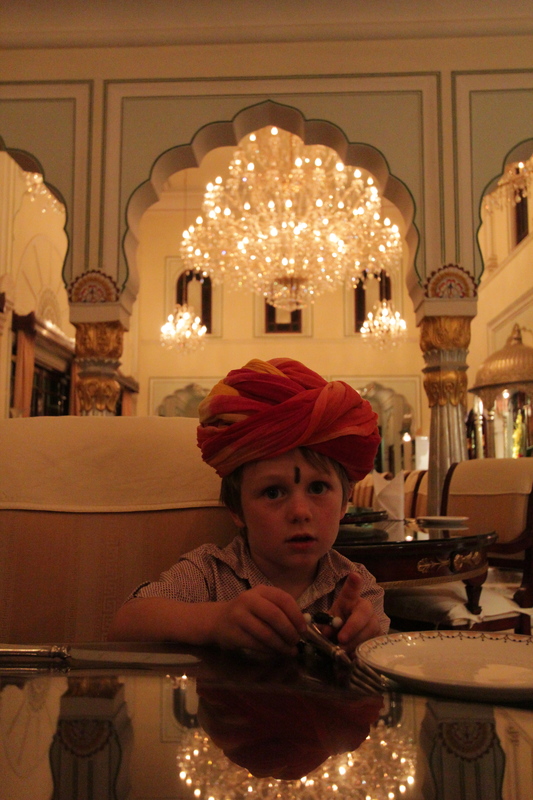 It’s a bit like being the maharaja himself! Gwen was ecstatic to find a giant chess board. 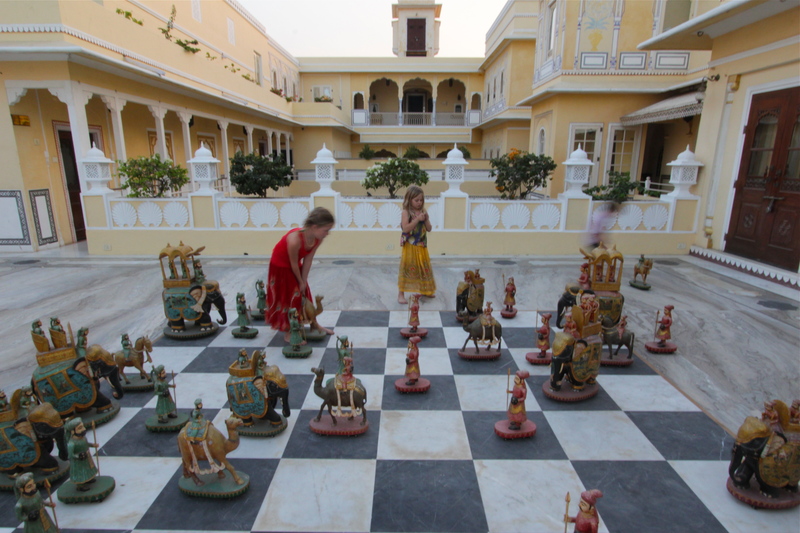 The pieces were hand-carved and had little wheels on the bottom so you could move them. I woke up yesterday to find the sky filled with kites. From every rooftop terrace kites sailed through the sky. 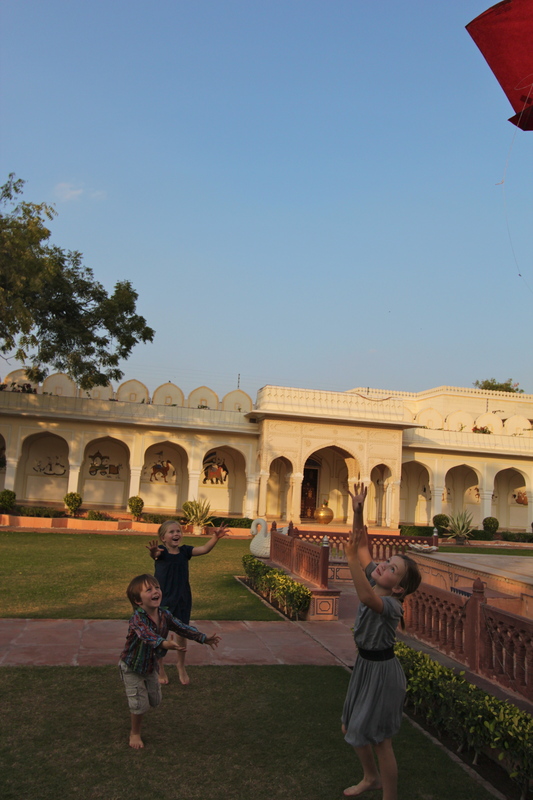 When we found a kite in one of the courtyards of our hotel we were all quite pleased. When the kids attempted to fly it, a hotel man came rushing to help us. He explained that the kite had been cut by another kite, that there is an upcoming kite festival in january, and everyone is practicing their kite techniques. He then showed us the thread of the kite, washed in glass powder. When a kite attacks another kite, it can cut through the kite string (and if your not careful, your finger). 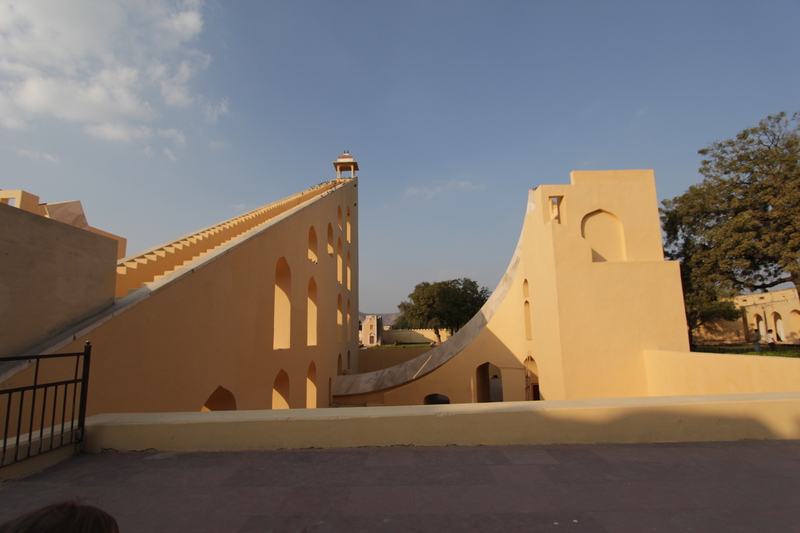 The Jantar Mantar Astronomical Instruments built by Maharaja Jai Singh II. This dude really was a mathmatical renaissance man and really into the sciences. Don’s kind of place. 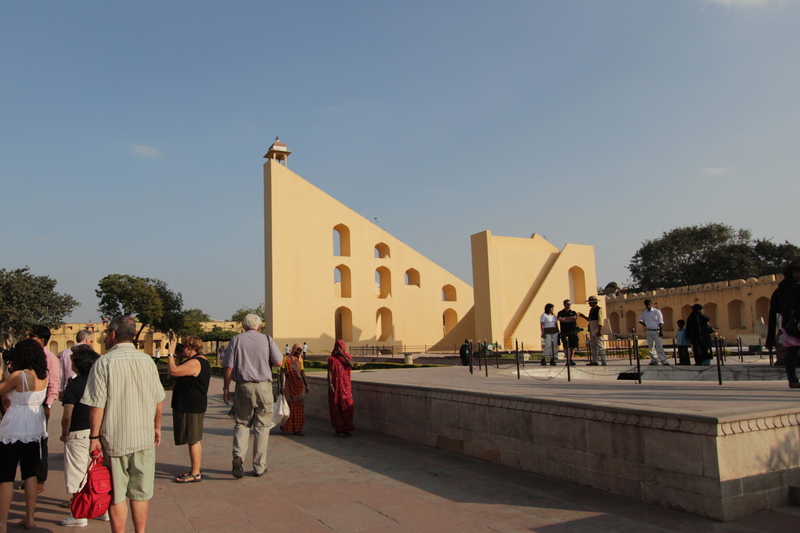 The world’s largest sundial, 90ft high, built 1727, the shadow moves visibly at 1mm per second. 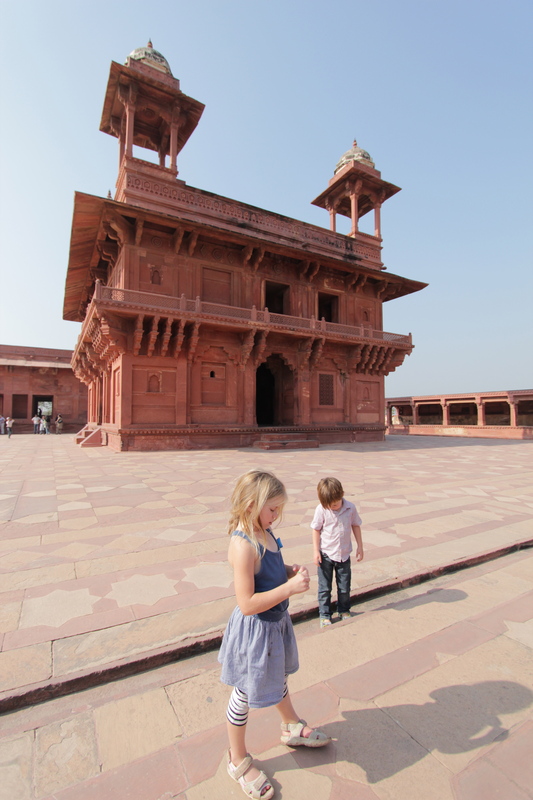 Outside of Agra is the palace of Fatehpur Sikri. It was built at the same time as the renaissance was occuring in Europe. 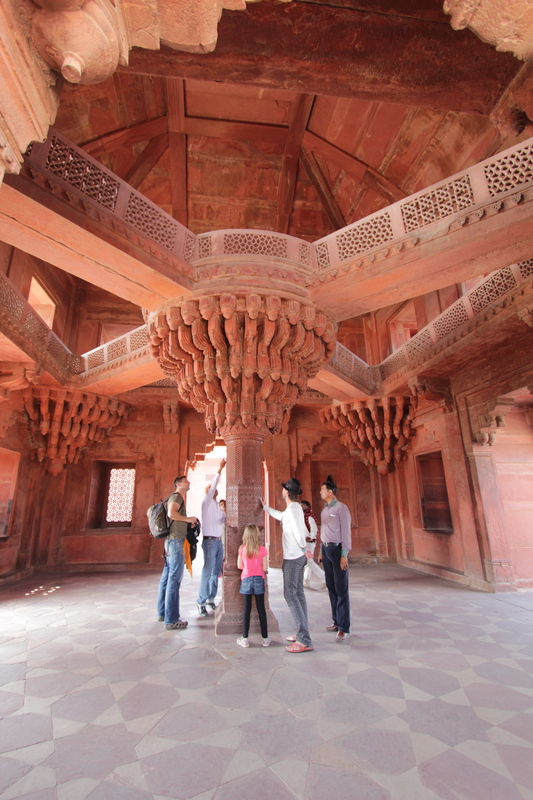 A beautiful palace built by the third mughal emperor, Ahkbar the Great. He had three key marriages (of 36), one for each faith: Christain, Muslim, and Hindu and therefor had the love of everyone. a true diplomat! 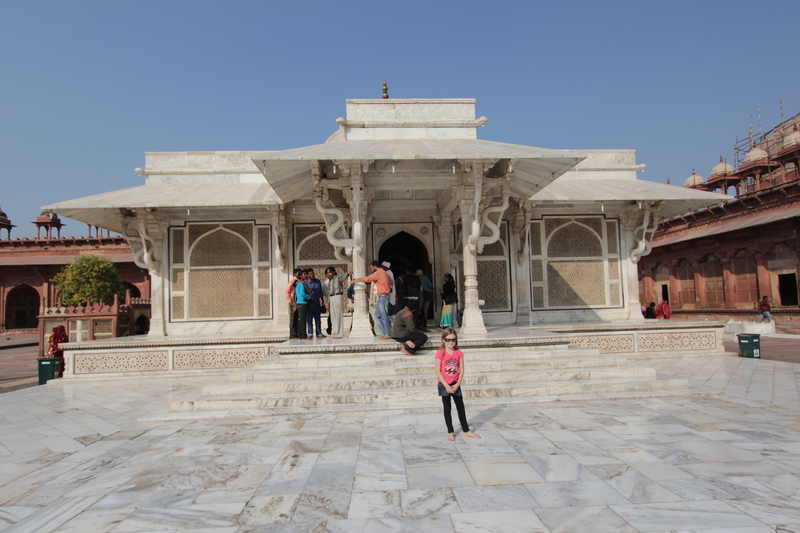 The tomb of Salim Chishti, a sufi saint, who foretold the birth of Ahkbar’s only son. 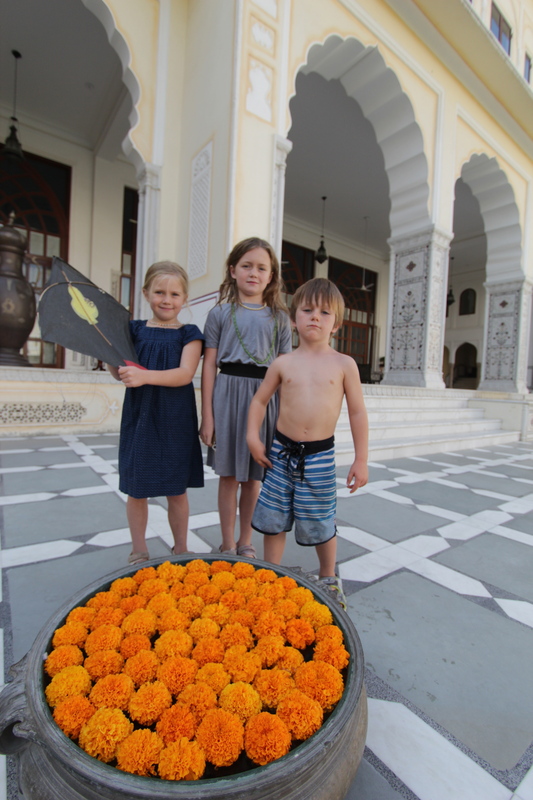 Devotees ask for the blessings of the saint and hope for fulfillment of their wishes. 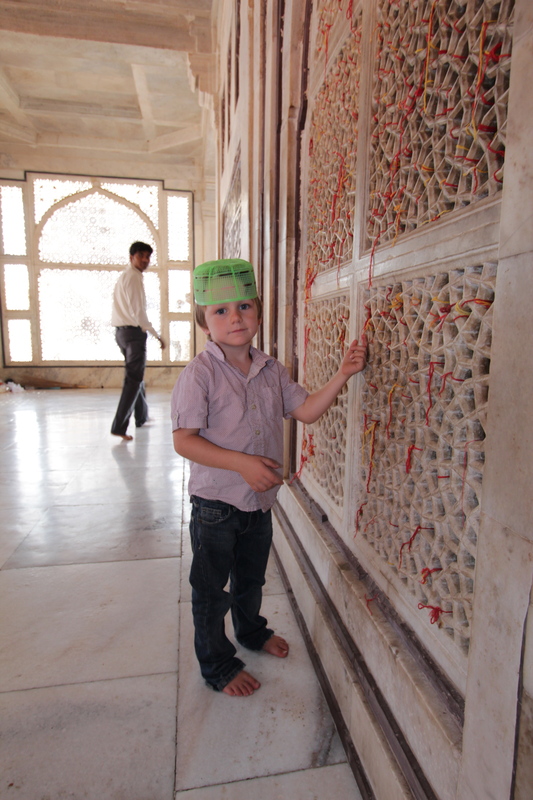 We tied a thread on the marble screens and made wishes. 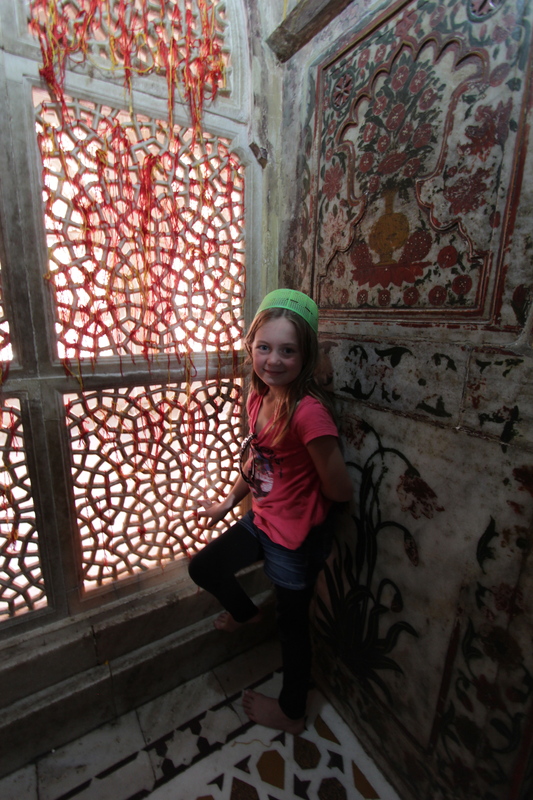 I can’t help but feel a bit relieved that we made it out of India safe and sound and healthy. Phase one of our trip is over. We have mixed feelings about coming back to the west and leaving Asia. Italy feels a lot like home compared to where we’ve been, and France will seem even more so. It’s exciting to see such a different culture. 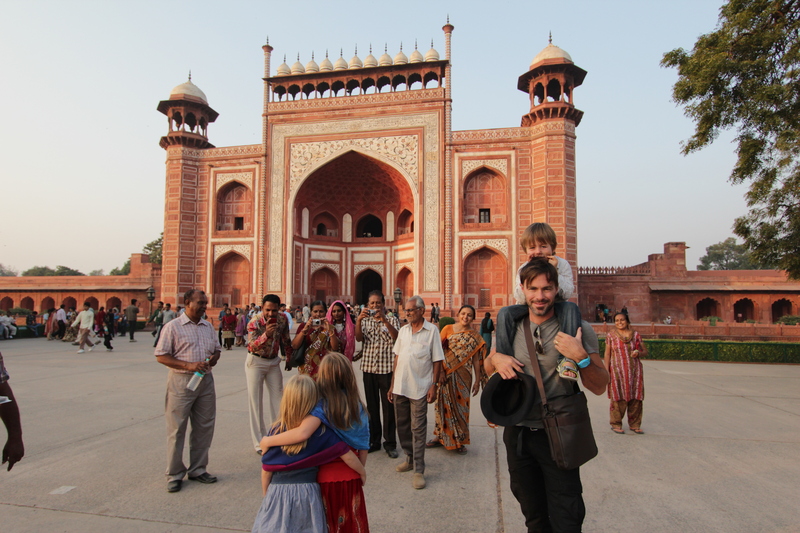 We wanted to leave after a week of India, and then we wanted to stay. Do something that scares you everyday to feel alive. Take chances! Make mistakes! Get messy! India is all these things and more. It’s very inspirational. It really does feel like anything is possible in India and anything can happen. 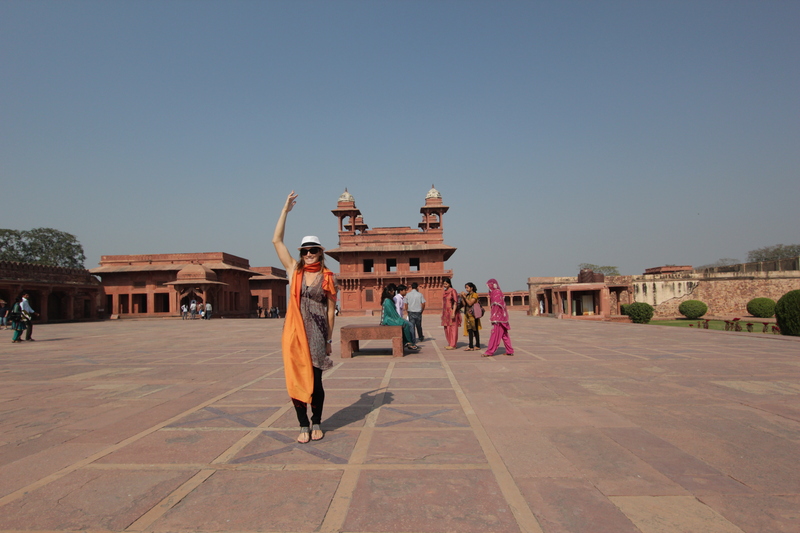 Can’t wait to go back…. Top of the list for next travel. And now…. We are super excited about Christmas!!! 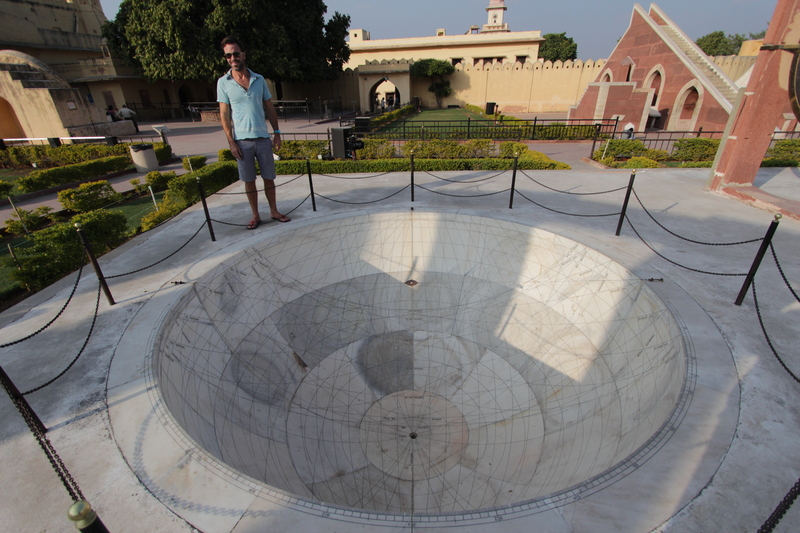 There was not a trace of it in India and it could have easily slid by with no notice. Let it snow! Bring on the cold, the tinsel, and all the festivities. Joyeux Noel!!!!! what an amazing posting. Amazing…..and the color and light is so wonderful. I can’t wait to go….top of my List too. Have a wonderful Italy, France and Christmas. 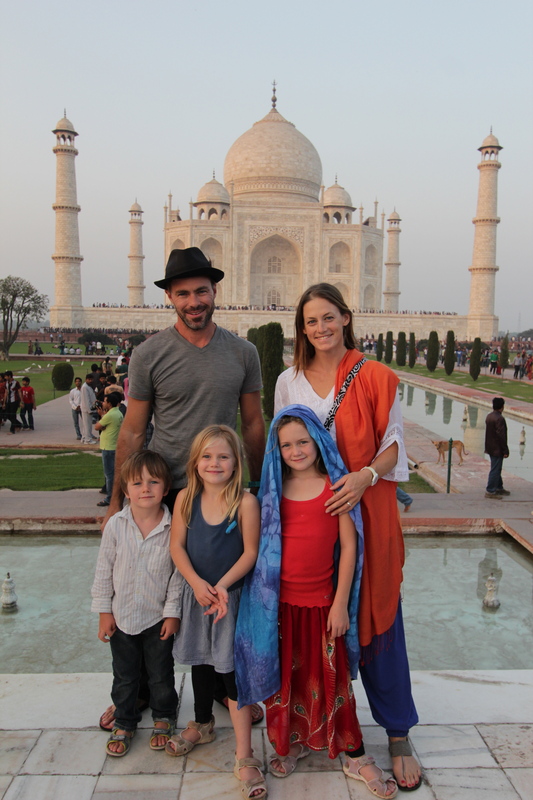 Hi Anderson Family, again, loving the blog… so interesting and a very small opportunity for all of us to travel along on your Odyssey. Sarah and the kids are off to Maui today (12th) and Im following them on the 16th – 4th… looking forward to the beaches; however, Vancouver is beautiful today and the mountains look enticing to my new found ski passion. Safe and indulgent travel wishes to the entire worldly-Andersons! Merry Christmas! Love, RT, SB, PT & CT!